YVY has been chosen to participate in the Quality New York National Association for the Education of Young Children (NAEYC) Accreditation Project, an initiative sponsored by the United Way of New York City, in partnership with Bank Street College of Education and Child Care Inc. Director of YVY Federal Programs Wayne Goldberg is part of the Accreditation Leaders Group, and Farragut Road Education Director Bina Cunin is part of the Directors Group. Both groups meet monthly to support and guide agencies preparing for the complex NAEYC Accreditation process. Last year, Silver Lake Head Start I at 141 Park Hill Circle became the first YVY site to receive accreditation. NAEYC-accredited programs have demonstrated a commitment to providing a high-quality program for young children. Accreditation involves a period of self-study in which early childhood program personnel and parents conduct a thorough self assessment to determine how well their program meets the NAEYC’s criteria, make any needed improvements, and report compliance with the criteria in detail. Silver Lake Head Start II at 20 Park Hill Circle is eagerly awaiting its NAEYC validation visit on February 20. The validation visit is the final step in the year-long process of becoming NAEYC-accredited. After this visit, a three-person NAEYC Commission will make the accreditation decision and Silver Lake Head Start II will be notified in the Spring as to whether or not it was successful. Our site at Farragut Road is currently in the planning stages of applying for accreditation. While the accreditation process examines the entire program, the greatest emphasis is placed on the quality of interactions between staff and children, and the developmental appropriateness of the curriculum. Health and safety, staff qualifications, physical environment, and administration are all reviewed during the accreditation process, but primary consideration is given to the quality of the child’s experience. Since the system began in 1985, NAEYC accreditation has become the standard by which early childhood programs are judged; programs receiving accreditation are considered of the highest quality by parents and educators alike. Yeled V’Yalda has been chosen to participate in the UCLA/Johnson & Johnson Health Care Institute, aimed at empowering Head Start and Early Head Start parents to make better decisions about their children’s health care needs. Seven Yeled V’Yalda staff members participated in the “Train the Trainers” Conference this past June at UCLA to learn how to educate parents to make proper decisions about the health care needs of their children. Team members include: Wayne Goldberg, MPA, Project Director; Gary Ellis, MD, Director of Health Care Initiatives; Jennifer Henle, MD staff at Ezra Medical Center; Janie Friedman, RN, Health Coordinator in Brooklyn and Director of Expectant Moms Program; Bassie Morris, CSW, Social Services Coordinator; Maryanne Haggerty, RN, Health Coordinator in Staten Island; and Svetlana Tenenbaum, MPH, WIC Nutritionist. The Head Start management team is now educated to lead an effective health care training program through empowerment and dissemination of knowledge. The training for the Head Start families of Staten Island was launched at Silver Lake Head Start, 10 Gregg Place, on Friday October 28, 2005. As a part of the initiative, the UCLA Head Start Management Research Director, Dr. Ariella Herman, led the effort utilizing Gloria Mayer’s health care reference book, “What To Do When Your Child Gets Sick,” as a tool in training the program. Dr. Herman and her team will continue to assist with the three -year training program of our Head Start management team members and parents. Yeled V’Yalda has undertaken intensive outreach efforts to enroll as many parents as possible who are targeted for the program. The agency offers transportation, on-site childcare and meals in order to encourage the parents to attend the training. Parents who participate will receive Gloria Mayer’s health care reference book to answer more than 50 common questions regarding childhood medical issues. The agency will train approximately 300 families and monitor and record the progress of each family’s health and comfort level. The Health Care Institute is the result of a successful pilot training program conducted in 2001 that showed that providing Head Start parents with convenient, easy-to-understand health care information can improve the quality of care for sick children while reducing health care costs dramatically. In addition to decreases in visits to health care providers and emergency rooms, there are many other benefits related to this study, including: increased parent awareness to health warning signs, quicker response to early signs of illness before medical problems become large, book used as a reference in the home, better understanding of common childhood illness issues, fewer absences at school, and return to school sooner from illness. Head Start families who participated in a health care training program reported a 37 percent drop in visits to health care providers and a 48 percent decrease in emergency room visits in the six months following the training. This also translated into a dramatic 43 percent drop in the number of days parents lost at work and a 41% decrease in the number of days children were absent from school. The Institute’s goal is to train approximately 12,000 families nationwide by the end of 2005, which researchers estimate would result in a direct savings to Medicaid of nearly $2.4 million annually. 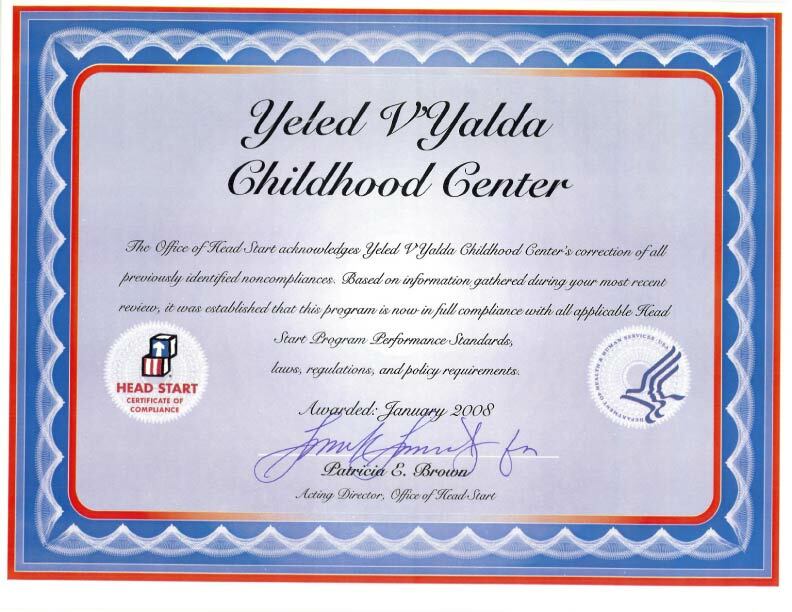 Seventy percent of children in Yeled V’Yalda’s programs are enrolled in Medicaid, Medicaid Managed Care of SCHIP. Yeled V’Yalda projects that the program will also save its families in health care costs and time lost from work and school. 2/28/05 – Congressman Vito Fossella (R-NY13) today joined with the organization Yeled V’Yalda and Staten Island families to celebrate the grand opening of new Head Start classrooms at the Silver Lake Preschool and Nursery. The new classrooms will allow Yeled V’Yalda to serve an additional 18 children at the school. The group purchased and renovated the Silver Lake site and now serves 72 Head Start and 16 early Head Start children in 6 classrooms and an additional 32 infants/toddlers and their families in home-based care. Head Start is the most successful, longest-running, national school readiness program in the United States. It was created in 1965 to provide comprehensive education, health, nutrition, and parent involvement services to low-income children and their families. More than 21 million pre-school aged children have benefited from Head Start, according to the National Head Start Association. Yeled V’Yalda, in partnership with Ezra Medical Center, today also unveiled its new mobile dental van, which will provide dental services throughout the borough as part of its “Miles of Smiles” campaign. The van features two dental chairs and is fully staffed with pediatric dentists and support personnel. The van makes regularly scheduled visits to Head Start sites on Staten Island and in Brooklyn. Yeled V’Yalda is a large, multi-service agency serving more than 2,000 children and their families in Staten Island and Brooklyn. The group operates 3 Head Start sites on Staten Island, including its original head Start site at 10 Gregg Place.